Supermarkets in both Japan and the United States carry food products from around the world. Japanese supermarkets are often smaller than American ones, but in crowded urban areas they sometimes spread over two floors to make room for more goods. American supermarkets now carry many Japanese food products, and Japanese supermarkets carry many American ones. American supermarkets are now following the Japanese pattern of offering many kinds of prepared foods in single servings that can be taken home and heated in the microwave for a quick meal. 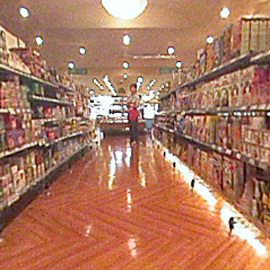 Click on the Audio-Video link below to explore a Japanese supermarket in virtual reality.